In 1682, William Penn came to America to "create a better world" on a 26 million acre tract of land, given to him by King Charles II, which he named Pennsylvania—literally, Penn's Woods—to honor his father. Penn was Quaker and encouraged people of other faiths to settle in the new colony. He believed that all religions should be tolerate d and all people should be respected—to the point where, although the acreage had been given to him, he paid for rightful ownership to the Lenni Lenape Indians who were the original inhabitants. Despite this, he owned African slaves, which seems at odds with his principles and religious beliefs. 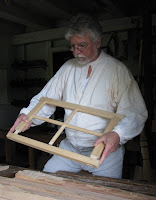 He chose a piece of land on which to build his estate and named it Pennsbury Manor. 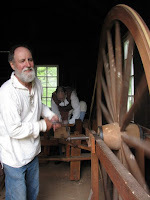 Weavers, gardeners, beer makers, cooks, blacksmiths, and woodworkers kept the plantation running smoothly. 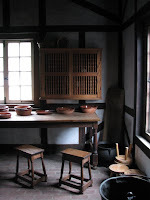 Our tour guide escorted us through the bedrooms, dining areas and kitchens in the main structure and explained that one room in particular was used as a pharmacy. If you had an ailment, herbs and other things were mixed together and used as remedies. He said that if you had a sore throat, 3 items were crushed together in a mortar and pestle. Due to the unsettling image of the 3rd ingredient, the first two have completely disappeared from my memory. "Dry white dog turds," combined with the other two elements, were blown into the back of the sick person's throat. Do you think it was a successful cure? I sure do. Who the heck would dare complain of a sore throat after that? Pennsbury Manor fell into ruins in the early 1800s and by the turn of the next century, the land was completely devoid of all structures. 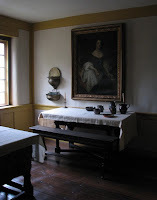 Archae logists discovered the foundation in the late 1930s and the Manor was rebuilt through the WPA, by referring to William Penn's notes and drawings. 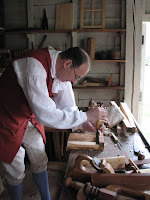 Other outbuildings were constructed, including the joyners' workshop, which is where my partner and I spent HOURS with Adam Cherubini and his fellow woodworkers in a two room building with very tall workbenches. Adam is 6' 6". Adam invited us to use all of his tools: wooden brace (made by him) with spoon and shell bits (totally fun! 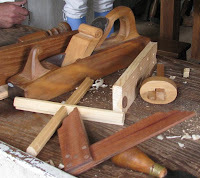 ); try, smooth, jack, and moulding planes; frame saw; and treadle and great wheel lathes. 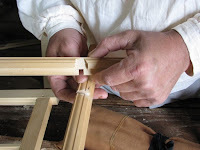 He showed us how to cut a rabbet with just a chisel and demonstrated his techniques with various tools. In the group photo, left to right, are Warren, Paul, Adam, and Dave—four woodworkers who spend their time poking fun at each other, giving demonstrations, and building things for the Manor, thus proving that the joyners have the best job on the estate. Despite the rainy day, we had a fabulous time. 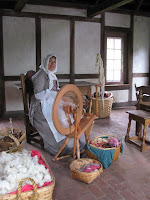 If you plan to visit, take note that the joyners are in the shop the first Sunday of each month.